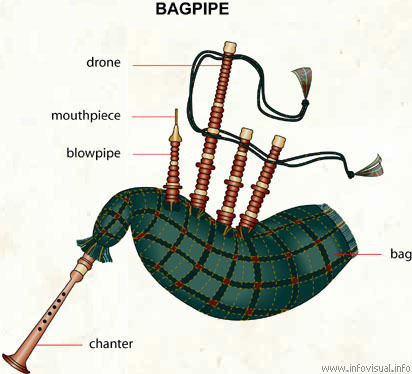 Bagpipe - Visual Dictionary - Copyright © 2005-2016 - All rights reserved. [img]https://infovisual.info//storage/app/media/04/img_en/018 Bagpipe.jpg[/img] [url=https://infovisual.info/en][/url] - [url=http://www.infovisual.info/]Visual Dictionary[/url] - Copyright © 2005-2016 - All rights reserved. Bagpipe: wind instrument composed of pipes, reeds and a bag. Bag: generally made of animal skin. Air reservoir operated with pressure to produce the sounds. Chanter: conical double reed piece with holes to produce the notes. Blowpipe: air entry that is inflated by the musician. Mouthpiece: piece of the mouthpiece that has a clack valve to prevent the air from escaping. Drone: produces a single continuous note that support the melody.